A couple of months ago I was the person you'd hear saying 'I'm not joining any more social networking sites, I already spend way too much time on Twitter and Instagram' but low and behold, another social site has wormed its way into my life and I've spent the past few weeks becoming more and more addicted to it. The social networking site in question is Pinterest! Before joining I never really knew what it was about or how it worked (and I'm still not entirely sure) but I always heard people talking about how addictive it is and being a huge lover of photography and looking at beautiful images, I knew it would be right up my street. Another reason I became more and more interested in joing is because I was gaining a fair amount of traffic from it, even though I wasn't a member myself. I was pretty confused as to why this was happening (not that I was complaining) so I went and did a little bit of digging and found that other people had taken photos from my blog (particuarly photos of my dressing table) and 'pinned' them with a link back to my post. I didn't realise it was possible to do this but its actually a great way to get your blog out there whilst having fun at the same time. I'm going to make a point of ensuring all of my blog photos are now pinned onto Pinterest because who knows, someone might like them and stumble across my blog! I've also found myself feeling so inspired by some of the images I've come across since joining and its given me a real boost - whether that's an uplifiting quote when I'm having a down day, a kick up the bum to go for that run I keep putting off or some ideas for home decor or recipes - it can all be found on Pinterest. There's even lots of blogging tips and advice over there so its really worth having a look if you're lacking some inspiration. I've even roped my boyfriend into joining and although it might seem like more of a girly website - he's thoroughly enjoyed flicking through photos of gadgets, watches and various other typical man stuff! I just love that whatever you want to find, its there. 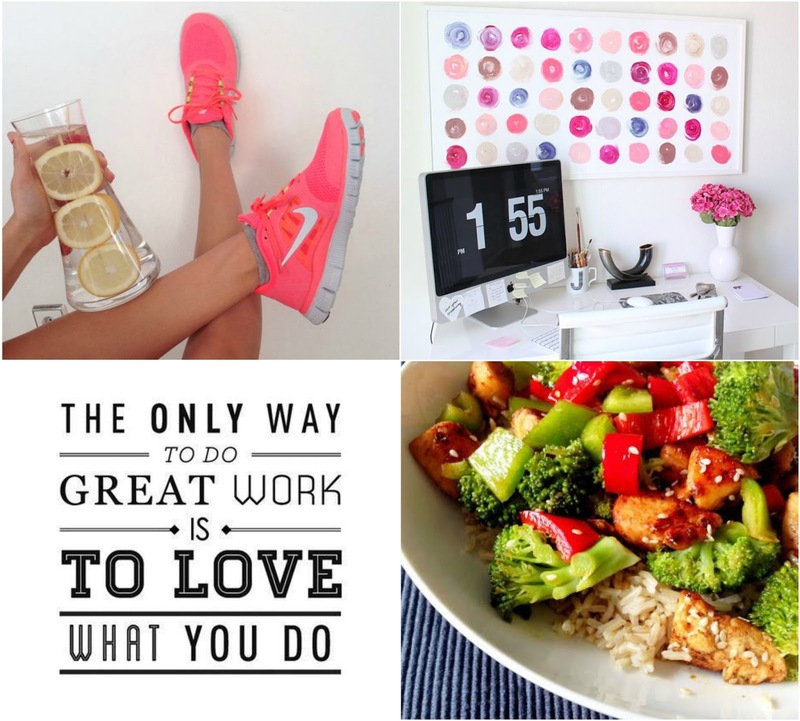 The collage above is a little selection of the kind of things I've been pinning lately - I've been particuarly obsessed with searching images of beautifully decorated offices (I'm determined to have a pretty office and MAC computer one day), healthy recipes, exercise inspo and inspiring quotes! I've also been contributing to Benefit's #awesomeaugust board over the past few days which they've created as a celebration of all things fun this Summer! They've got a pretty cool competition going on too so be sure to check that out and you can read my guest post on their blog here for some more cool bene-updates. I still can't believe one of my all time favourite beauty brands asked me to guest post for them - its such an honour! I hope you all like my post and if you do, be sure to tweet me (@k_leexjx) and Benefit (BenefitUK) to let us know! If you want to follow me over on Pinterest to see pretty photos of beauty, home decor, fitness food and fashion - you can find me here. Do you use Pinterest? If so, leave your usernames down below - I'd love some new accounts to follow! Pinterest has to be one of the top sites I spend my time on, hours just seem to fly by without me realizing! Pinterest is a genius site - it's my first stop when I start to run out of ideas or inspiration! I feel the exact same way about Tumblr! The photos I see really inspire me to create content for my blog as pretty as the pictures on there. So inpiration post!!! Pinterest and tumblr are amazing!!! I love using pinterest :) it is great! i went through a little break but i'm back to loving pinterest! i love doing s/s and a/w boards for seasonal fashion inspiration! I really love pinterest, I think it's so good for blogging inspiration!